At last the time has come! I couldn't stay up late enough last night to see the content drop (and didn't want to ruin it by being too tired) so I'm up fresh, bright and early to enjoy Wintersday. Superior Rune of Lyssa: This item now applies 5 seconds of Protection and Retaliation while on a competitive PvP map. The item’s internal cooldown has been fixed to allow rune effects to occur every 10 seconds. Rare crafting materials and holiday materials can now be deposited into the collections tab in the bank. Added Mystic Forge recipes to convert ascended rings to their infused versions. “Bag of Gold” has been renamed “Bag of Coins” for clarity. “Bag of Gems” has been renamed to “Bag of Jewels” for clarity. Equipment sorting bags will now properly sort back items and trinkets. The Durmand Priory heavy armor set now has proper icons. Dessa’s experiment journal now plays an effect on consumption. Weapons purchased with karma from vendors in Fireheart Rise, Iron Marches, and Fields of Ruin now have their intended skins instead of tier 3 cultural skins. Extended potion recipes can no longer be discovered, and must be unlocked using an item sold by dungeon vendors. Extended potions now last for two hours instead of one hour. The Mystic Forge recipes for offensive and defensive infusions now take five skill points instead of 50, and omni infusions now take ten skill points instead of 100. Increased the drop rate of Passion Flowers from Passion Vines. Several items now have updated icons. Rank-based finishing moves now last for 60 minutes per consumable instead of 30 minutes. The pirate weapons Trident, Speargun, and Harpoon have been updated to their intended model. Black Lion harvesting tools icons have been updated. The simple infusion for defensive slots has been removed from the vendors, and the cost of the versatile simple infusion has been lowered to 75 tokens. The Black Lion Chest drop chance for mystery tonics has been reduced from 100% to 25%. Tonics now have the same drop chance as “Heavy Bag of Coins,” “Unidentified Dye,” or one of three new Guild Influence items worth 50, 100, or 300 influence. “Heavy Bags of Coins” have been added to Black Lion Chests in the tonic and buff drop sections. Bags hold between 80c and 1g50s. “Glory Booster” has been added to the list of possible buff drops. Buff drops now occasionally drop the “booster multipack” triple buff. Rarity and proportion of all other Black Lion Chest drops have been rebalanced to reduce overabundance of some items. The Black Lion Trading Company is also celebrating the Wintersday season with new deals and special items. New Wintersday-themed items are available in the style category. A festive fur cap is available for 150 gems for a limited time. A full winter outfit, including a hat, coat, gloves, boots, leggings, and a snow globe scepter with five winter themed costume skills is now available for 700 gems. PvE decorative wood weapon skins for staff, sword, greatsword, dagger, shield, axe, hammer, pistol, longbow and short bow are available in the style category for 500 gems each for a limited time. Wintersday earmuffs are available in the style category for 25 gems each. A free wizard’s hat is available in the style category for every player to enjoy. Rare mystery Wintersday boxes will have a chance to drop throughout the world. They will also be available in the consumable category of the Gem Store. They will contain gifts available in-game, plus a random item only available in the store. 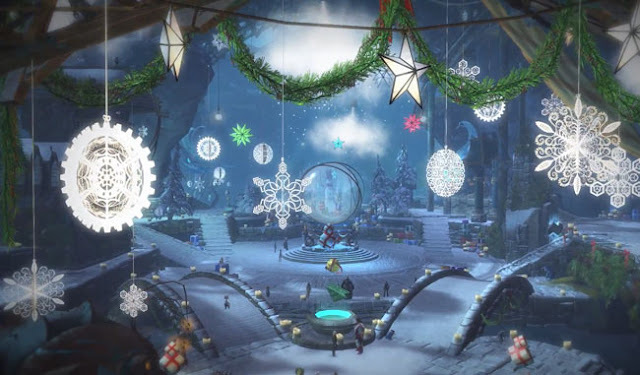 Common: a Wintersday dye pack, a gingerbread snowball mortar, or one of three unique Wintersday transformation tonics. The Wintersday baby quaggan miniature can also be crafted in the Mystic Forge by using any combination of miniature snowmen, infinirarium, or festive golems, and 50 enchanted stuffing (available in-game). The “mystery Wintersday box” is available in consumables for 100 gems each, or 10 for 800 gems. The Black Lion Chest has also been updated. Check the items section of this update for more information. More items and sales will become available over the course of the Wintersday festivities, so be sure to keep an eye on the Gem Store. That's a lot to look at and analyse so expect another post today OR what you can do is sign up over at our forums. I plan on doing a lot of lurking there on my second monitor whilst experiencing the fun and frolics of wintersday! Investors were banking on them containing skins. It looks like they've almost abandoned the idea of the keys>chests being used during events. They did tweak them so that they are a bit better but still, with a single key worth, what, 125 gems (well over one gold)they haven't made the chests that desirable. The tweaks may bring the prices up but I'm doubtful. I'm holding onto my stockpile in case they make further changes in future.